Our next stop was Tuscany, the Italian province famous for its wine and olive oil. Our guide’s name was Clara, a young-looking grey-haired lady wearing a summer dress with a stubborn strap that wouldn’t stay on her right shoulder. She didn’t speak English as well as the others. Many times, she would pause mid-sentence and search her vocabulary for the right English word and a lot of those times, we would wonder if she would finish the sentence at all; like someone who began saying something before realizing that it wasn’t worth saying. 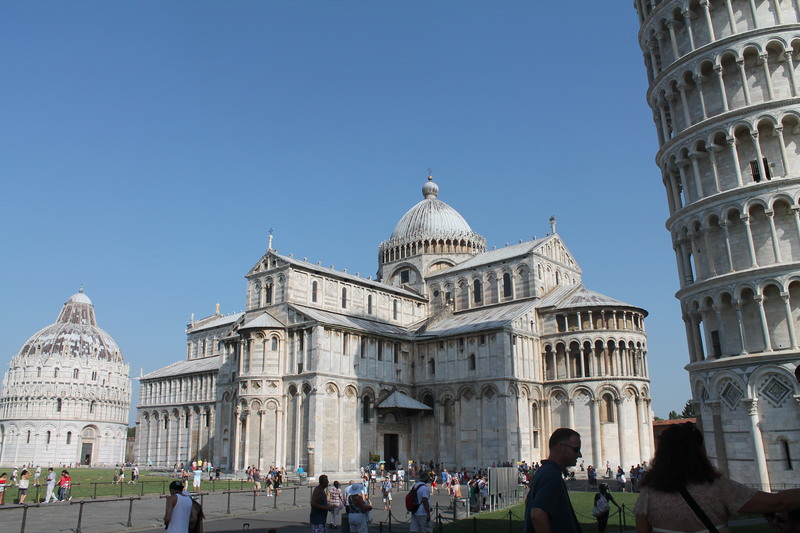 Our tour began in Pisa, home of the famous leaning tower. The tower is one of a trinity of buildings in the wide green field in the centre of the small town. There is also cathedral and a baptistry and, like the tower, they too have sunk into the softened ground. When the 12th century workers came across the architectural droop, the project was suspended for many years until the foundations could be stabilized. Then, it was slowly built up over the next 146 years. The poet Gabriele d’Annuzio called this place the “meadow of miracles” but it wasn’t because these poor dunces actually managed to build these magnificent structures on a marsh. It was because he was convinced you couldn’t find the same beauty anywhere else. The hundreds of tourists scuttling around the field make it tough to tell if he was right or not. There are few things more frustrating than looking back at your pictures and seeing someone standing dead centre, taking a picture of something to the left of the frame. To this day, I still wonder what those people were taking a picture of. The tower is behind them. Are they so desperate to get one shot of their family unimpeded by that one tourist (which I see in nearly every photo from Pisa, by the way) that they are now taking pictures of the bakery that’s opposite the tower? The tourists are ruining this place. Can’t they see? We didn’t spend much time there. After snapping a few pictures we took a walk through the gift shops where I’m almost certain I felt the faint tingle of vertigo (a thousand little leaning towers will make a whole shop feel like it’s leaning to the right). Once we left, Clara remembered she needed to pick up a few groceries so she figured it was a good opportunity to turn an unexpected stop into an olive oil tasting. She obviously knew the place well. It was still before noon and noone was there except the middle aged lady who owned the place. Clara and her joked in Italian while the owner drenched pieces of fluffy Italian bread in four kinds of olive oil, each one slightly different. 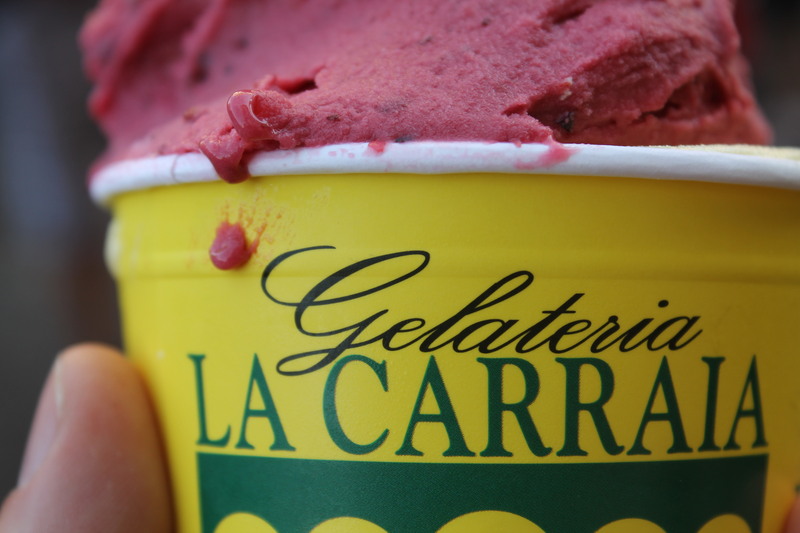 Two were airy and smooth, while the other two lingered at the back of your throat after each bite. All of them were thick and flowed slowly out of the bottle, like liquor from the freezer. They also sold wine from a pump coming out of the wall. The meter just above the pump showed the price per litre, litres filled, and total price just like a gas pump would. Inside was a strong house wine pressed from the local grapes. “We never sit down to a meal without a bottle of wine on the table,” Clara told us. We tried some of it but the pumps were broken so we couldn’t buy it. “They should come to fix it some time in the next month or two,” the store owner said since every Italian (almost without exception) is on vacation in August. We were content to pick up a few bottles of olive oil and go on our way. We took the back roads to get to Florence. It took some extra time but it made the city feel like an urban sanctuary on a harsh pastoral landscape. We drove over and around the sprawling hills, the scattered villas and wide green vineyards spread out between the dusty soils. The trees and vines in these oases were arranged in perfect lines extending along the gentle slopes like a wave. At a lowpoint on the landscape we finally saw the city, cut through by the river Arno. 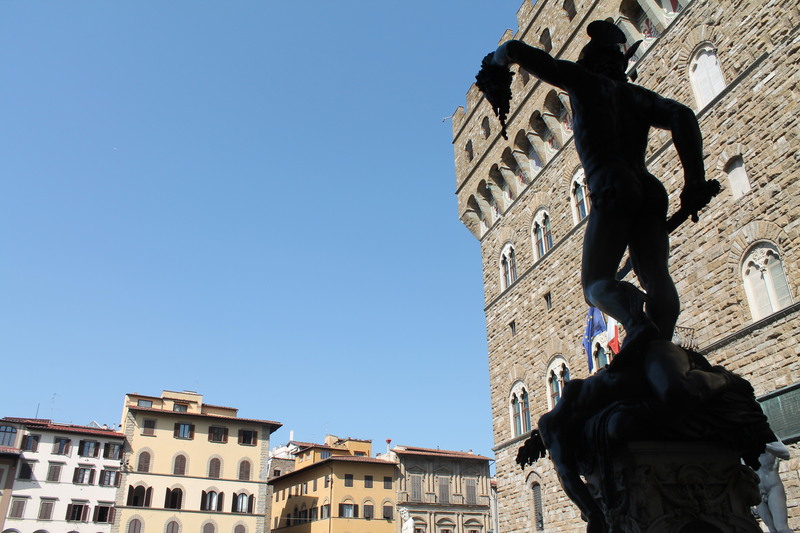 The Renaissance began in Florence. Around the 16th century it was the hub for European intellectuals and home to great poets, sculptors, painters, and architects. 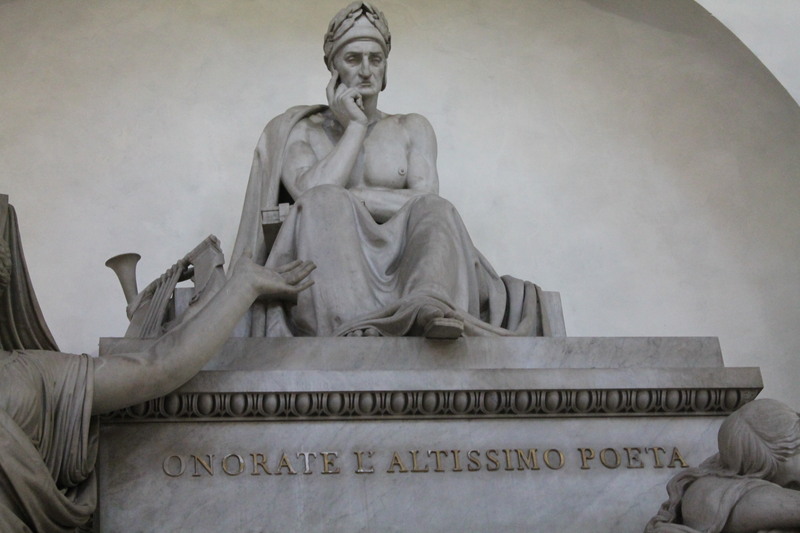 Outside Santa Croce church stands a stone statue of Dante Alighieri, widely known as “the” poet and father of the Italian language. He lived in Florence. Inside the church, there is an even more magnificent memorial portraying him between two women – one proclaiming, the other mourning. Close by, Michelangelo’s elaborate and colourful tomb stands behind a plain rope barrier. “I don’t understand why this one is bigger than Michelangelo’s?” my Mom whispered as we watched a tour group clamour in front of Dante (his body isn’t actually in this church). 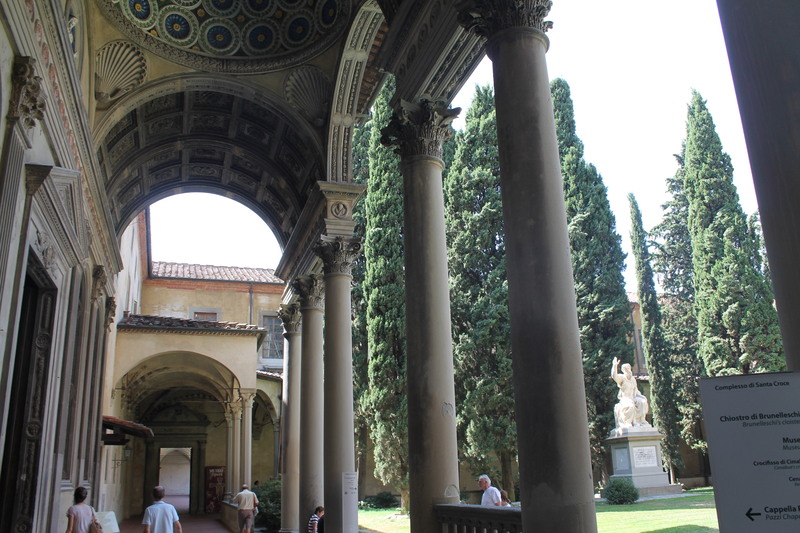 Most people seemed so drawn to these two monuments that it was easy to forget the other incredible men who lie in this church – Machiavelli, Rossini, Galileo. While we were there, Aidan quietly murmured about how all these churches seem the same. Listening to Norm order lunch in Europe was always something I looked forward to. 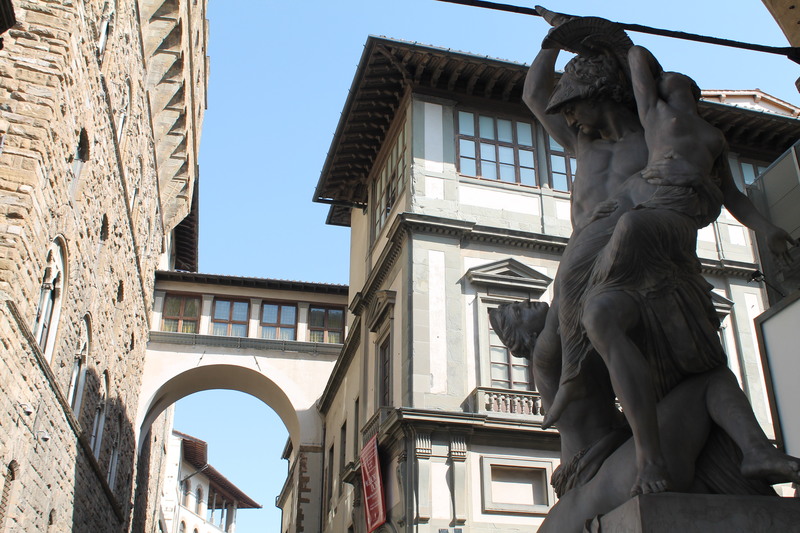 In Florence, we stopped at a touristy spot not far from the Duomo at the centre of the city. As the waiter approached, Norm – in what I can only imagine was an effort to impress – zealously seized control of the situation. He began the order with a French greeting (an upbeat “boujour!”), using Spanish numbers (accompanied closely by hand gestures), a tone that fell just short of condescension (to ensure the waiter caught every word), and no Italian whatsoever (except the accidental Italian when he used the Spanish numbers). Then, just for good measure, he would sometimes throw an “–o” on the end of an English word (el checko?). Thankfully, the waiter was a good sport. “Maybe it would be better if I just spoke English,” he said with a smile. 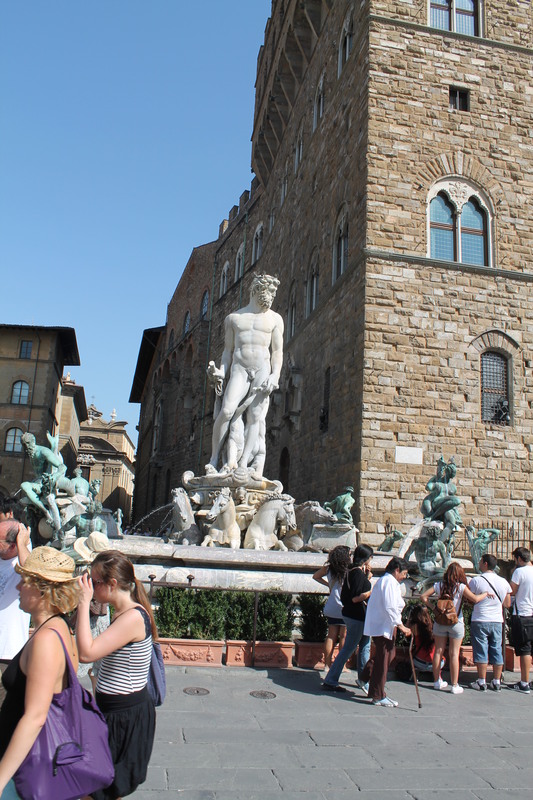 Of course, we couldn’t go to Florence without seeing David – Michelangelo’s most famous sculpture. It was €15 a person for admission to that museum, just so we could charge through the exhibits of contemporary art and musical instruments to get to the thing everyone came there to see. But before I explain what made this visit worth it – what was so striking about this statue of a young king – I would like to make two promises. First: that this is the first and last time I will use the term “striking,” in person or in my writing. Ever. Two: that you will no longer have to put up with my exhausting and verbose attempts to pull you through another church or museum after I’ve told you what I’m about to tell you. It’s bigger than I expected, standing as tall as three grown men. Every vein swelling in his arms and massive hands indicates an unparalleled attention to his creation. There was something very alive in the calm and distant stare; something inseparable from the thought which expresses it on a human face. Though we never forget that the stone cannot think, the question naturally arises: what is David thinking? Not what the artist was thinking, not what the biblical character was thinking, but what lies behind the expression frozen in this face? What is in the stone? The artist has fooled us. For a moment, we see something real in the art. One critic said that once you saw David, there was no reason to look at another sculpture again – this one is perfect. There were a few other stops on our tour: Ponte Vecchio – the “old bridge” – lined with all kinds of fine and not-so-fine jewellery vendors; Piazza della Signoria, a square scattered with almost as many 16th century sculptures as spacey, ice cream-licking tourists; a leather shop where I bought a bag and Aidan bought three pairs of brightly coloured loafers; a flea market, densely packed with merchandise; and a crowded ice cream parlour on our way out of town. We enjoyed our ice cream in the van, out-of-sight of any potential and obnoxiously observant writers who would make fun of us. Before Mom, Norm and Aidan fell into a coma in the back seat, we made small talk for a few minutes. “Has it been as dry here as in the rest of Italy?” my Mom asked Clara as she pulled herself towards the driver’s seat. Beatrice was Dante’s muse. While the poet only met the historical Beatrice a handful of times during his life, she appears as one of his characters in his most famous work: The Divine Comedy, a vivid journey through every circle of Hell, Purgatory and Paradise. She is Dante’s guide through Paradise. The Italians have names for most of the weather. The current heat wave was called “Lucifero” after Satan, a more familiar character from Dante. Soon we stopped talking and I struggled to stay awake while I thought of these names. They seemed so fitting to describe the weather, mostly because the weather is more important than most of our dull conversations let-on. You see, it wasn’t just rain that was coming. These were life-giving waters, pouring out of heaven to soothe the scorched earth and heal the withered crops. What else should they call the heat has tortured the grapevines and reduced the roaring river Arno to a few wet stains and a trickling stream? Just heat? You could, but there’s no wonder in the simple label, no expression of the injury it has caused. Dante’s names are perfect. Still, none of this makes it any less remarkable that these 700 year-old words still hung off the tongues of Italians today. You’ve heard it said that there won’t ever be another Michelangelo or Dante and this is true, but it’s no different than saying there won’t be another you or me. Even if there isn’t another me, that won’t be a reason for anyone to hang onto this journal for 700 years. My words will never be used to describe the rain. But these artists will be remembered. Even after the the Sistine chapel fades, I think the name “Michelangelo” will still mean something. The fragile memory will outlive his art if only as a myth linking us to our past. After our copies of Dante turn to dust and the hills have worn away, people will still read him – no matter how many times we must rewrite and translate. It is a marker from where we have come; a step on the staircase of art, that will retain some essential human truth no matter how high we climb. Someone somewhere will always be willing to follow the poet on his journey; to get lost in it in even after we acknowledge, implicitly, briefly, that Dante couldn’t have possibly walked through Heaven and Hell himself. We read to swim in his visions of that otherworldly place as his art pierced through our cloudy notions of what is and isn’t possible. His grace fools us. And so the question naturally arises: Was what Dante wrote true? The truth can be a foolish thing. I always knew this was the way it is. That day in Florence convinced me this is the way it should be.